Back in December, I was asked to participate in the CHA Ranger Designer Challenge. This year the task was to use Dina Wakley's Media line to create whatever we wanted on a canvas base. I had to think a while about this one. I'm not a painter but I love the thick heavy body paint, so I just decided to get over myself and try. 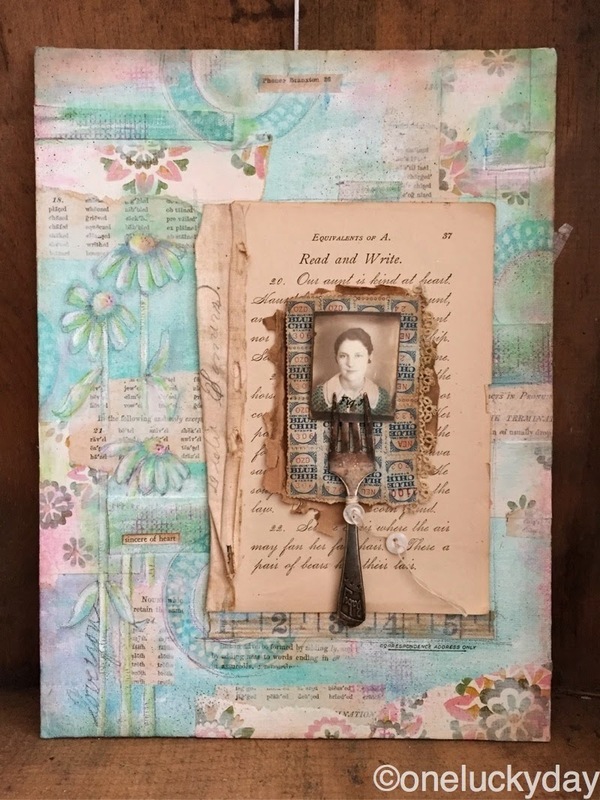 After a Gesso base was painted on (and dried), I added ripped pieces of vintage wallpaper and pages from a vintage school book with Gel Medium. Once the papers were secure, I started adding layers of Dina's heavy body paint (sky, turquoise, lime, and magenta) to the canvas. Like I stated previously, the paint is thick and smooth. It is super easy to manipulate with a brush or wet wipe. I think my biggest challenge was knowing how much to squeeze out of the tube...sometimes I got it right and other times I had way too much. I think it is just a matter of practice really. Funny story before I go on...I decided I really wanted a small touch of yellow (lemon). 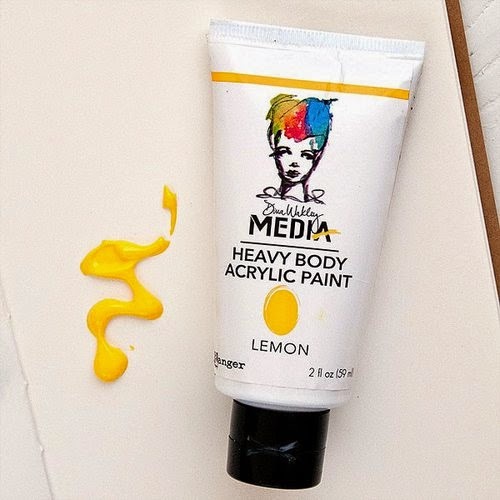 I did not get that color in my box, so I went to my local craft store and purchased a tube of Lemon. I get it to the check out counter and the cashier does not know the price - so with a nice long line behind me, she says into the microphone, "PRICE CHECK ON BODY PAINT". I quickly stated that it is found in the art section and it's acrylic paint...and not edible the last time I checked. Once I had a basic painted background, I used a pencil to sketch some flowers, stems and leaves over the surface, then colored in what I had sketched. You might notice I added painted Sticky Back Canvas in a few places just to give the canvas more texture and interest. The last step was to add some stamped images (circles) and the written words, love you. I used Archival ink in Aquamarine for the stamping, so that it was waterproof. Once the background was complete, I added another page from the primer book as the focal point. 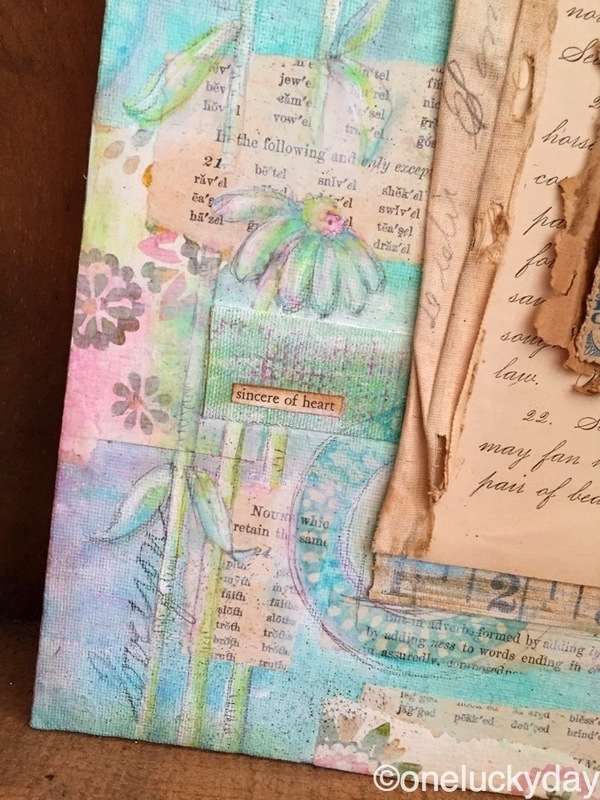 The old ripped paper seen below the blue chip stamps was sitting on my desk from another project - it came from a vintage cigar box. The blue chip stamps are a favorite of mine to find on junking trips (they were a big deal in my house growing up- it was my job to paste the stamps into the book!) 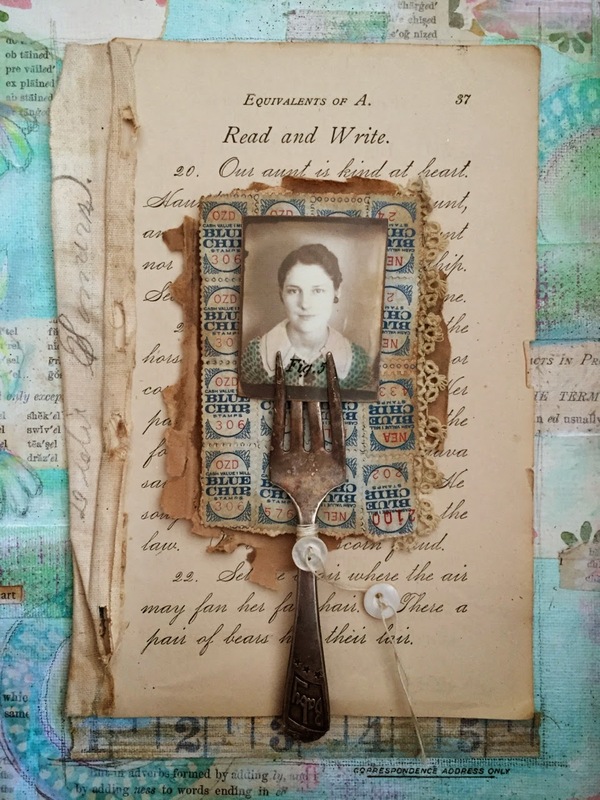 The baby fork is just something I had in my stash and the photo of the woman is from the new idea-ology Photobooth pack. There was a wonderful moment of serendipity while I was putting this together. I needed to get the entire page, Read and Write from the school book so I opened it as far as I could, which revealed the fabric tape that had been used to bind the book. Low and behold the owner of the book had written their name on the fabric tape. I was so excited to see that. It was really too good to pass up so I carefully removed it from the binding and added it to the canvas. It is laying on the canvas just as it was in the book, with one end rolled back. Now it was complete. If you have not seen the other designer challenge pieces, you can view them here on Rangers blog. Mine kinda sticks out like a sore thumb in the group but I'm okay with that. I did what speaks to me and that is good enough. Well, for me, yours sticks out because it is the one I like the best!! thaks bobbi - you are too kind! Love it. Now I have to find a school book with cursive writing! I love it!!! What an amazing piece! Nikki, you are welcome to use the fork idea or any other you see here! Although I can not imagine your work needing my help! Always amazing. Paula I love it and how you used the blue chip stamps with the fork! Very clever and your painting is great! Paula for someone who claims not to be a painter, - wow, this is amazing! The subtle colour palette is so beautiful, and I love the idea of the fork!! Brilliant with that photo as the focal image! Love this project!! thank you Astrid - you are too kind. I have to agree with Astrid, for a non-painter this really is very beautiful. I love the beautiful daisy flowers especially and the fork is a great and quirky addition. Meet Miss Prue, our nanny. She helps us with etiquette (like proper use of a fork), teaches us good grammar, and how to sew (mending loose buttons is her specialty). She's thrifty too and likes to save stamps. She has a passion for flowers and the loveliest wallpaper covers her room. This piece is terrific and tells me a good story. What a challenge you were presented with and you really came through shining. miss Bee, that is the most brilliant story to go along with my piece. Miss Prue it is! I love this Paula, the colors and textures are beautiful! Those stamps & fork - just wonderful! Sometimes sticking out is a good thing. I love how you took the bold colors and softened them. It shows how versatile the paint is. Jess, I never thought of that. That is a plus...the colors can be bold or softened with a wet wipe or the use of white paint, which I did. Fantastic! Love your art and admire your talent. Thank you for sharing. This fabulous! I appreciate you for walking us through your process. Thanks for the inspiration. Paula, I love your background. The blue chip stamps were big in my house as well. I still have a box of them and the green chip stamps. Beautiful canvas. Your canvas is stunning. And you sell yourself way too short! We had Green Stamps here in the south and I can still taste that stickum a gozillion years later! I still use the flatwear I earned with those stamps! My mom had a special sponge for pasting the blue chips into the book! That glue tasted terrible! Wow, I love this project !! Great background ! Lovely! I remember the green stamp store when I was little. So much fun putting the stamps in the little booklet. I adore old books with writing in them. Priceless! Love this, Paula. For someone who claims not to be a painter, it's pretty magnificent. This is a gorgeous project Paula. I really love the colors and the collage style, it tells a story. So you and so fantastic! LOVE this Paula! The wallpaper addition is perfect!